I have been to Greece and I have been to two Greek festivals. I’m thinking this makes me pretty much an expert on all thing Greek. Go ahead and ask me a question about Greece. For example, who was the Oracle? I know the answer. Where did the Apostle Paul travel on his second missionary journey? I know that, too. So, seeing that I am practically Greek you can trust me that this recipe is good. There was a real Greek lady teaching at my school a couple of years ago. Each October her church had a festival and sold Greek goodies such as Baklava, Tiropetes, and Spanokopita. We willingly handed over giant sums of money to get these rare and delicious treats thinking that only a person of Greek heritage and special Greek know-how could ever possibly make such delicacies. I have since learned that this is not the case. Even I, of lowly peasant birth can create amazing Greek foods with the secret culinary weapon known as phyllo dough. In the South, they pronounce it like File-O Dough but being the Greek expert I am (since I went there once and have been to two Greek festivals), I can tell you it is pronounced Feel-O. My personal history with phyllo dough had a rocky start. If you don’t place a dampened towel over the dough as you are working with it, it immediately dries out and turns to a spiderweb-like consistency. Think about cooking with something as ethereal as spider webs and you can imagine why I haven’t made many dishes calling for phyllo. HOWEVER if you read the box and follow the directions thereon, phyllo is surprisingly easy to work with and very elegant and professional looking when you are done. I made a few alterations in the cheese that the recipe called for just because I was using what was on hand. I will include both variations so you can choose for yourself. 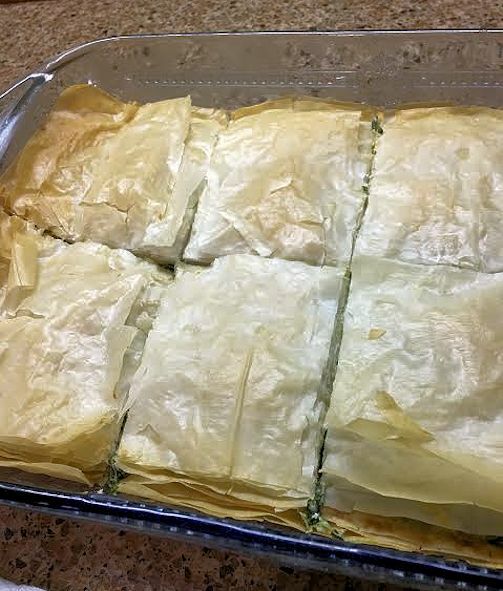 The original recipe came from a Betty Crocker International Cookbook but I made a few changes since I am such a Greek expert having been to Greece and to two Greek festivals! Cook spinach in boiling water until tender, about 5 minutes; drain. Mix spinach, cheeses, onion, parsley, dillweed, and salt; stir into eggs. Brush bottom of an 9 X 13-inch casserole dish with the softened butter. Unfold the phyllo leaves and cover with a damp towel to prevent drying. Separate 1 leaf and place in baking dish. Brush lightly with the melted butter. Repeat with 9 more leaves. Place filling on top of phyllo leaves. Cover filling with a phyllo leaf, brush with butter and repeat with remaining 9 leaves. Cut pastry through top layer of phyllo leaves with a sharp knife into 8 squares. Cook uncovered in oven until golden, about 35 minutes. Let stand 10 minutes. Cut through scored lines to serve. Each serving is approximately 310 calories.